We can find historical news from the end of 1700 and they are about the production methods of Sardinian cheeses obtained from raw milk or warmed up through the immersion of red-hot stones. Concerning the production of Sardinian Pecorino, new basic methods were spreading at the beginning of 1900 and they were the use of thermometer, the filtration of milk and the use of liquid rennet. After, during the post-war and the sixties, some new important methods concerning the improvement of the hygienical conditions of transformation were introduced. “Saggezza e Tradizione” wants to make its clients taste these delicacies that nowadays are still produced by Sardinian shepherds as the local tradition wants, that is with local sheeps freely grazing on this beautiful Island where the grazings are uncontaminated and where it’s possible to find spontaneous medical herbs that give perfume and a unique taste, very particular and intense to the cheese. Sardinian Pecorino can be stored for long periods. It can be served shaved or with fresh vegetables. There is a good combination with lattuce, grapes, pears and honey but it can be tasted also as second dish. Furthermore it can be used to make first and second dishes taster. Sardinian Pecorino can be used also simply with carasau bread, which makes it taster. It can go with local wines of the Island as “Cannonau”, a red rich wine and with “Vermentino”, a white and perfumed wine. 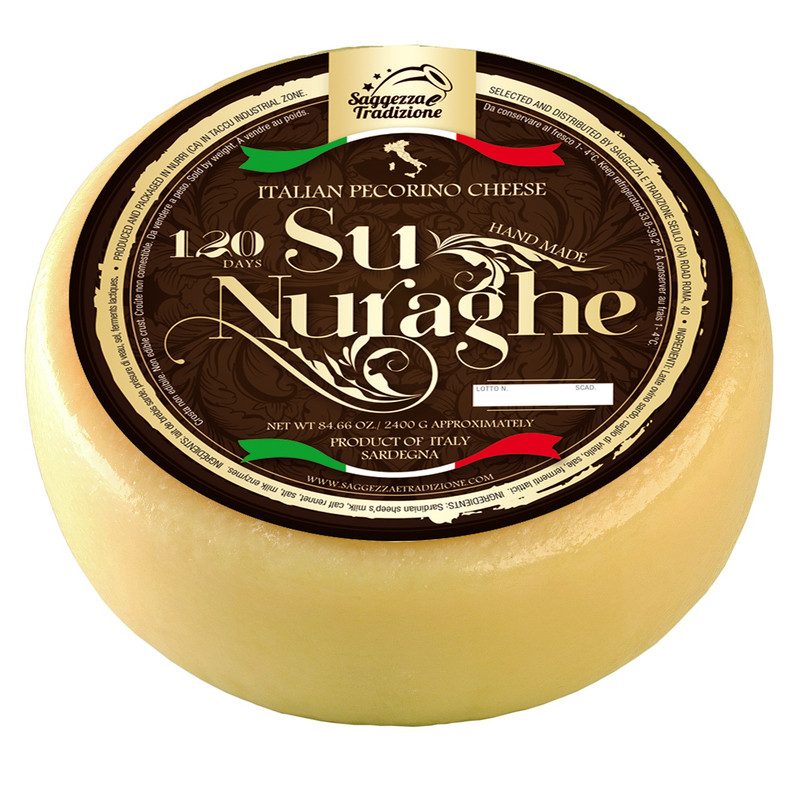 Sardinian Pecorino cheese “Saggezza e Tradizione” selected for you takes its name from an ancient building of the nuragic civilization: “Su Nuraghe” (prehistoric fortress-house characteristic of the Sardinian territory). “Su Nuraghe” pecorino cheese which can have the fresh, semi-seasoned and seasoned variations, is a sheep cheese obtained only from local sheep’s milk, rennet, salt and milk enzymes. Its face is a white pastry straw-coloured, solid with small holes, compact, with an aromatic and pleasant taste. While externally, it has smooth crust and it is straw-coloured. These peculiarities can be found only in the cheese worked, produced and seasoned in the inner part of Sardinia.